To any awaiting this next installment, my apologies. Blame the Internal Revenue Service for having a ridiculously complex tax system; I have admitted defeat and committed to pay a substantial proportion of my income to some accountants. Sadly, that doesn't relieve me of much work as I still have to spoon feed them the data. And on top of that, it's been pointed out that I've mis-numbered my posts, so I can't even count... Never mind, let's talk about something pleasant instead, shall we? My notes from the lecture say that during the Great War, jewellery manufacture nearly ceased in Britain, and probably most of Europe. I guess it's pretty difficult to set diamonds properly when the bombs are raining down upon your head. However, in the U.S. jewellery manufacture continued as usual and costume jewellery became increasingly popular. Now we came back to the Cambridge emeralds; it seems that Queen Mary's brother Frank (Prince Frances of Teck) died unexpectedly in 1910. He had never married, but that didn't mean he left the emeralds to his only sister; no, of course not. He left them to his girlfriend. If this sounds like silly gossip, wait til you hear how the emeralds came into the royal family to start with: Prince Adolphus (7th son of mad King George III) and his wife, Augusta of Hesse-Kassel - the then Duke and Duchess of Cambridge - happened to enter a lottery for charity in Frankfurt (one website says they were auctioned at a charity ball in 1818). Anyhow the prize they won was a box of cabochon (stones that have been cut but not faceted) emeralds. The website I've used to check my notes estimates between 30 and 40 of these large emeralds. I wonder how much a lottery ticket cost them? 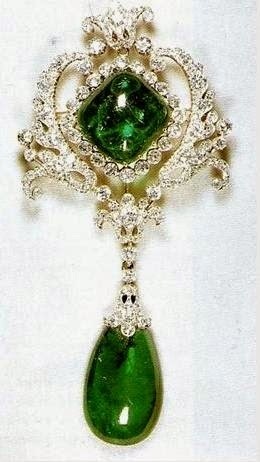 Anyhow, these emeralds, or at least some of them, were made into some earrings a necklace and were handed down to their daughter, Mary Adelaide, Duchess of Teck (Queen Mary's mother). From her they went not to her eldest child, Mary, nor to her eldest son or youngest son but to her middle son, Francis. Frank never married but gambled a lot and had this affair with the Countess of Kilmorey. 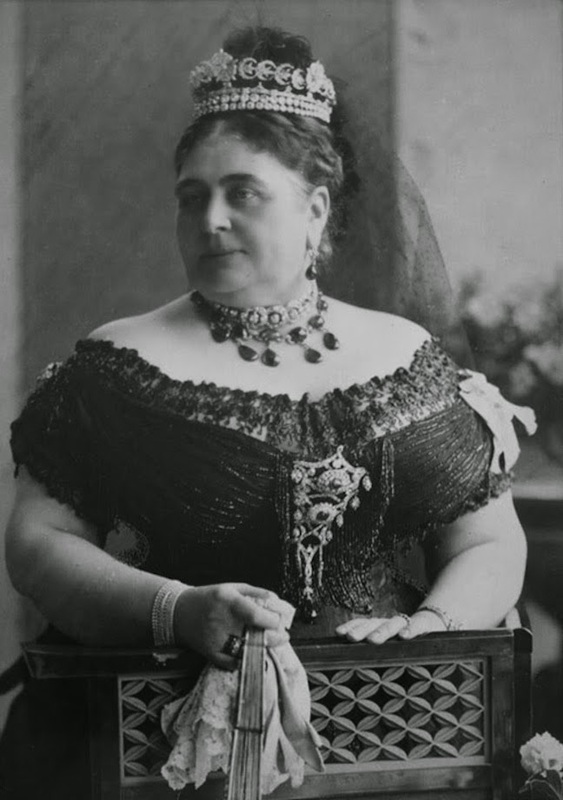 His elder sister, now Queen consort, of course thought this woman most unsuitable to own the emeralds and she got them back, paying her £10,000 for them. The present value of that amount is estimated anywhere between £600,000 and £800,000. 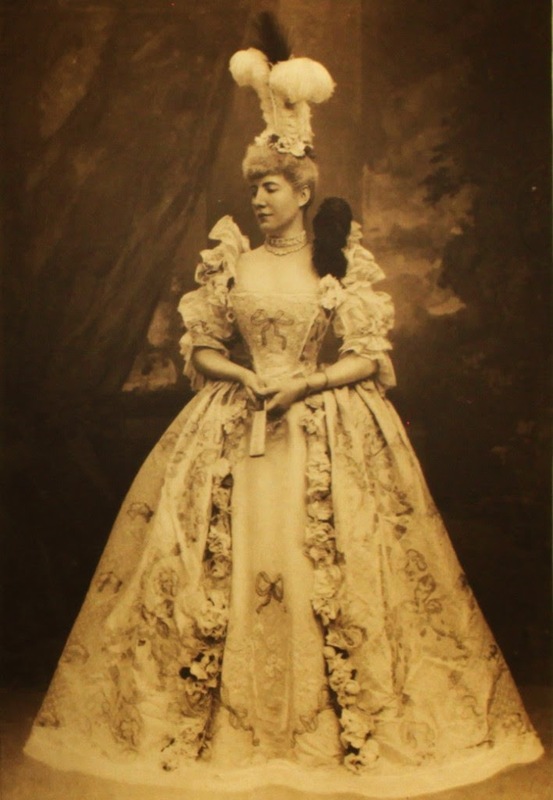 It must not have taken her that long to accomplish as they were all ready for her to wear to India in 1911. 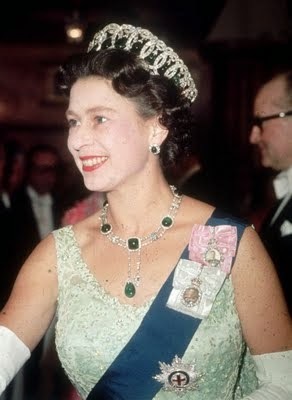 As part of the process of getting the emeralds Mary had her brother's will sealed so no one else had access to it and this has become standard practice for royal family members since that time. Who knows how many juicy stories we've missed out on? Anyhow, back to the Cambridge emeralds. I had to learn some new terms to interpret my notes. Apparently 'garland style' jewellery was all the rage around the turn of the century. This is just as it sounds: the metal and stones were shaped to look like what Caesar wore around his head, plus some ribbons and flowers and such. 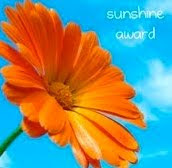 It refers to the motif generally used more than the way the pieces were fashioned. On the other hand, so far as I can tell, in 1910 some of the emeralds were in a festoon style which might also be described as 'garland-like'. I'm clearly no jewellery expert here. a V-shaped piece of decorative cloth, worn over the chest and stomach by men and women in the 16th century, later only by women. The last couple of decades one hasn't dared to have matching shoes and bag, or nail polish and lipstick, never mind jacket and skirt or earrings and necklace. The fashion press has called this 'too matchy-matchy'. However, being able to buy several pieces of the same suit (assuming in my case they were even new) or shoes and bag at the same time has to be a sign of conspicuous consumption so it was only a matter time before the idea returned. Before you know it we'll all be able to wear our emerald earrings along with our emerald necklace and rings again; or even our tiara, earrings and necklace (not to mention our stomacher). 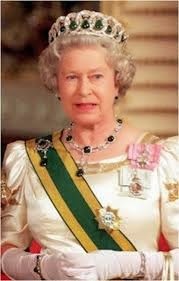 In any case, we know the emeralds came off the tiara and were redesigned after WWII into a lovely necklace with some detachable drops. The adjustable nature of some of the royal jewellery may not be widely known. 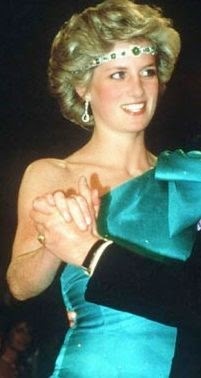 We were told that when Princess Diana wore this necklace as a choker and later as a sort of a flapper-style headband that people were outraged that she had 'ruined' a priceless necklace. I'm not a fan of emeralds with a turquoise dress. It is a little strange perhaps, if we were correctly informed, for the headband to be secured with a strip of Velcro! Then again, how strange is it for the "next one" to also wear this same necklace? 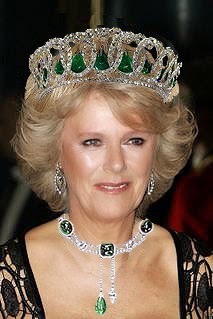 The Cambridge emeralds are now in the Vladimir tiara. I think had I been her I'd have rummaged in the treasure chest a bit longer and found something different to wear.